"The Copper Closet is a ministry of Copper Canyon Baptist Church that gives clothing and household items to those in need." 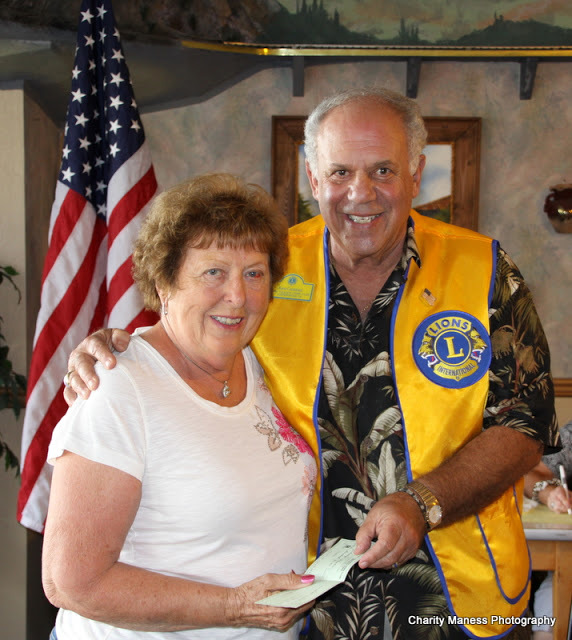 Shirley Wunder recognized for her charitable efforts At the 9-11-13 Lions Club meeting local resident and community servant Shirley Wunder was recognized and honored for her unending support and help for those displaced by the RIM fire. Shirley volunteered countless hours at the Sonora Evacuation shelter serving meals and helping in anyway that was needed. Shirley has also organized and heads up the Copper Closet, a free clothing distribution to those in need in Copper. The Copper Closet is open at all Copper Food Pantry distribution days and the clothing is clean and free. Thank you Shirley for your care and love of your community and the people in it..
NOV. 2013 - THE WEATHER DOES NOT STOP THE PANTRY OR THE COPPER CLOSET VOLUNTEERS! !